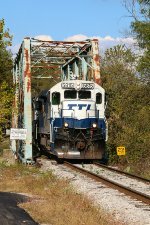 Album Info: Photos from the Transkentucky Transportation Inc. Railroad, the TTI. Description: While touring the facilities at Paris, TTI 5884 returned from working a local job. Description: TTI 5815 brings an empty coal train south over the bridge at Millersburg.